Automatic card shufflers, as well as hand-cranked ones, provide the perfect way to speed up your favorite game nights, and are surprisingly convenient. They come in a wide range of styles and various sizes. This article is going to review ten of the best card shuffler devices on the market, to help you find a product to your liking. All the products reviewed here were chosen based on popularity and user ratings. One of the best card shufflers around is made by TradeMark Poker. This shuffler can hold up to six decks of cards at once, making it one of the largest options on our list. It’s powered by four C-size batteries, and is very easy to operate. It is compatible with standard-sized cards, as well as bridge cards. The card collection tray is located at the base of the unit, and conveniently slides out when shuffling is complete, for easy dealing. 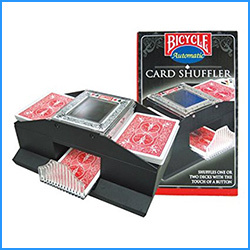 The Bicycle 1005808 card shuffler is powered by a 9-volt battery, and has enough space to shuffle up to two decks of cards quickly and easily. 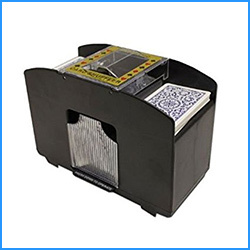 This shuffler is designed for use with both bridge and poker cards. Once fully shuffled, the deck is automatically placed at the base of the unit. This product is available for purchase on Amazon, and qualifies for the Prime free shipping program. 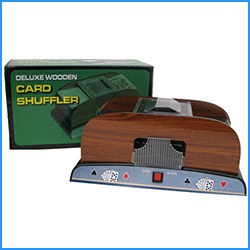 This particular card shuffler is one of the quietest options available. It doesn’t use any batteries, and it’s operated via an easy-to-use hand crank system. With enough capacity for two decks of cards, this shuffler is suitable for family get-togethers and small parties. It’s also one of the more affordable options on our list of products. With its simple design and quiet operation, this is an excellent choice to consider. 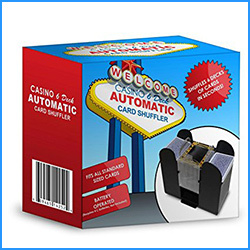 With its one button design, this is one of the easiest to operate automatic card shufflers. It has enough capacity to hold four decks of cards, making this the best card shuffler for medium-sized card games. The unit is powered by four C-size batteries, and is relatively lightweight. It is compatible with both blackjack and poker card sizes. The shuffled cards are conveniently stored in a container at the base, for easy dealing. One of the most affordable options on our list is the Brybelly card shuffler. This model is powered by C batteries, and is surprisingly quiet for its low price. It can hold up to four decks of cards with ease, and it’s compatible with a wide variety of card types, including children-friendly cards for games like Uno. This is a perfect choice for families with small children, as well as adults who have arthritis. 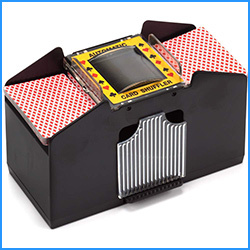 This Forum Novelties card shuffler is the best card shuffler for people who also want to buy the playing cards at the same time. This kit comes with two standard playing card decks, and also includes 5 dice. 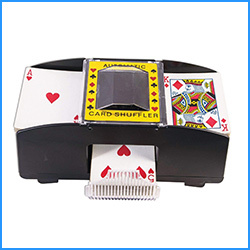 The card shuffler is powered by four AA batteries, and is very easy to operate. With enough space for up to two decks of cards, this is a perfect choice for small card games and family game nights. With enough capacity to hold six decks of cards, this is the best card shuffler for small table spaces. It’s designed in a way that it is built up, rather than out, to reduce the amount of space it takes up on your table. It’s powered by four C batteries, and is compatible with bridge and poker cards. Shuffled decks are stored conveniently in a clear tray, for you to deal them out easily. The shuffler is available for purchase on Amazon. 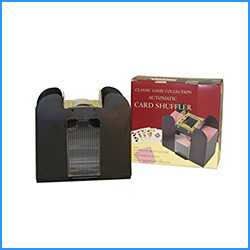 One of the best features of the TMG card shuffler is the easy to unload plastic tray. This makes this model a great choice for people with arthritis who want a shuffler that is very easy to operate. It has enough space to hold up to two decks of cards at once, and it’s compatible with most bridge and standard poker card types. This is another battery-operated shuffler that doesn’t require an electrical outlet. It only needs 4 AA batteries to work. The shuffler comes with a bonus deck of cards as well. For shuffling large decks of cards quickly and easily, the Brybelly card shuffler is likely the best card shuffler for you. It can hold up to six decks of any type of standard-sized playing cards. When fully shuffled, the decks are stored conveniently in the base of the unit. The shuffler is powered via four C batteries. This makes this model a great choice for areas where electrical outlets are hard to reach. 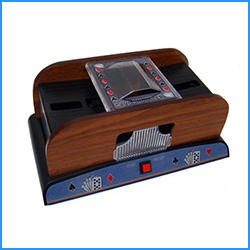 The TradeMark automatic card shuffler is designed for use only with Poker sized cards. This makes it a suitable option for people who are Poker enthusiasts. 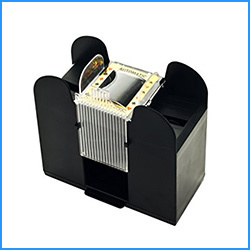 It has a two-deck storage capacity that is suitable for small and medium groups. It uses four AA batteries for power, and is very lightweight. 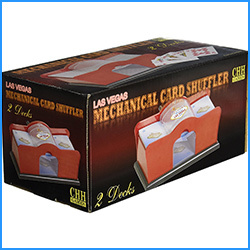 The shuffled cards are stored conveniently in the clear carrying tray located in the center of the unit. The card shufflers covered in our article are among the best options available. None of them require electrical outlets, and they shuffle decks of various sizes. Pick the one that is most suitable for your needs, and tell us about your experience with it down below. Feel free to also suggest another best card shuffler you think we might’ve missed in this article. The lazy part of me in games is card shuffling. Since I got the Bicycle card shuffler I play my games at will. It saved me the stress of that long process. We’re glad to hear the Bicycle card shuffler has helped you enjoy card games more. Thank you for your comment!